That’s the theme of the next Wooler Wheel Borderlands Sportive on May 13th as money from the event will go to support HospiceCare North Northumberland’s Hospice at Home Services. 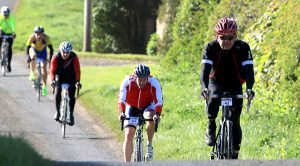 The sportive offers rides of 170km, 100km and 60km plus a Junior event for accompanied under 16’s of 30km. HospiceCare North Northumberland is a local charity which is dedicated to providing care and support to adults, carers and families, whose lives are affected by cancer and other life limiting illnesses such as respiratory and heart disease, Motor Neurone Disease, Multiple Sclerosis and Parkinson’s Disease. They are the only palliative care charity providing this service in North Northumberland, which is available 7 days a week, 365 days a year, day or night. All their services are free of charge so a GP referral is not needed. In the last 12 months the Hospice at Home Service nurses have delivered over 7,000 hours of care and support across North Northumberland. This year they need to raise over £525,000 and will receive just 7.5% contribution from the NHS, the rest they have to generate from local fundraising and donations. All donations stay local to help local people. 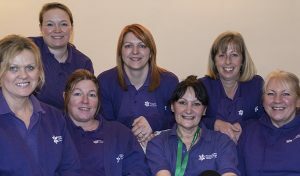 For more information visit www.hospicecare-nn.org.uk. The Borderlands event in May offers four distances and whichever you choose you are guaranteed a great day of cycling and countryside. Feed and water stations provide you with tasty treats on the longer routes, including flapjacks, from the Great Northumberland Bread Company, as well as jelly babies and bananas. And if you need a reason to hurry back then the delicious hot pies and mushy peas (plus a yummy vegetarian option) awaits you and is always welcome after the ride. For those of you doing the Junior 30k there’s a really special treat as once again Doddington Dairy are sponsoring the ride which means that everyone gets one of their famous ice creams at the half way point in Lowick. And for those of you who have the strength to look at more than the tarmac along the routes you will be rewarded with some fantastic views of the beautiful countryside across North Northumberland and the Scottish Borders. So you get your bikes ready and we’ll make sure they stay in full working order around the route as Edinburgh Bicycle Co-operative will be fixing mechanical problems and there’s not many problems Karl can’t fix. It’s only fair to remind you that there are some challenging hills from the first one at Weetwood Bank just a few miles from the start, to the ascents at Whitton Edge for those on the 170km and Flodden Edge for those of you taking on the 170m or 100km. But we haven’t lost anyone to them yet so you’ll all be fine. So get in some training and come and join us for a really worthy local cause. You can enter the event by following the link below. If you’re not up to riding but would like to help we would love you to help us by being a marshal on the day itself. You’ll be part of the team encouraging those who are riding to get around the, at times, challenging route and of course we’ll still feed you so you don’t miss out on those pies. Contact [email protected] for more details on how to become a marshal.